The floor must have been slippery Friday night in Sergeant Bluff, because it seemed like someone was always on the ground. Three SB-L sharp shooters, however, were able to stay on their feet long enough to each drain a three in the first quarter. 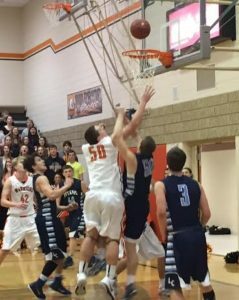 Chris Kroll, Keegan Savary, and Jacob Shultz got the Warriors headed in the right direction as they hosted the Lewis Central Titans, and all ended up scoring in the double digits by the end of the night. Savary was the first to put points on the board for the Sgt. 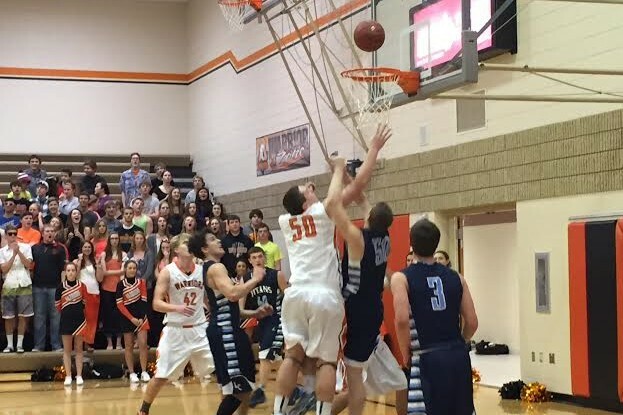 Bluff boys, and Kroll was right behind with a 3-pointer of his own. Shultz also shot a three towards the end of the quarter, giving SB-L the lead heading into the second. He had 11 total points and topped the charts with 8 rebounds. Jackson Wright with the layup. Lewis Central tried to come back before the half, but Savary hit another 3-pointer right at the buzzer to put the Warrior’s on top before going into the locker room. Savary scored 17 points throughout the game and also grabbed 7 rebounds, the second most on the team in both areas. Kroll stayed sharp in the third quarter with two more threes, contributing to his leading-scorer status at 21 overall points. SB-L finished the night with some great teamwork and phenomenal passes to seal the deal on a very physical battle. The final score was 72-64 in favor of the Warriors.